<firstimage=”//static.makeuseof.com/wp-content/uploads/2011/04/androidbrowserthumb.png”> Performance is important when browsing the web on a computer, but your average PC has plenty of power to work with. Using multiple tabs and loading pages is usually quick as long as you’re using the latest edition of any of the major browsers. Smartphones, however, are a different story. The hottest Android phones on the market right now are packing the nVidia Tegra 2 processor, which is substantially slower than any modern PC. When working with such limited resources, efficiency and speed are a priority. That begs the question – which Android web browser is the quickest? This is, I think, a good selection of browsers to look at. The only browser some might miss is Opera Mini Optimize Your Mobile Browsing With The Opera Mini Browser Optimize Your Mobile Browsing With The Opera Mini Browser Read More . Unfortunately, Opera Mini bombed two of my benchmarks (that is, it would not run them to completion). Opera Mini may well be great, but it’s hard to test something that can’t enter a score. The hardware I’m using for this test is the HTC Thunderbolt, Verizon’s new 4G LTE phone. My apartment is not in a 4G area yet, though, so I tested using the 3G network. All browsers were benched in the exact same location under the same conditions. I had an app killer terminate all programs between every benchmark to reduce interference. In this benchmark, higher is better, so this is another win for Firefox. 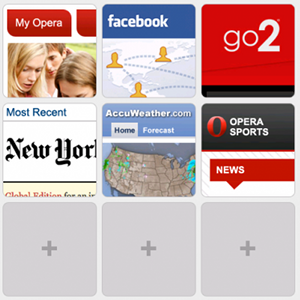 Opera Mobile, which was doing well in the Sunspider benchmark, fell off a cliff. The Dolphin browsers and xScope remained in the middle of the pack. Surprisingly, both the stock Android browser and Skyfire bombed this benchmark. Both of them ended at the benchmark at the error page, indicating they failed to properly complete one of the tests. Finally, I decided to perform a “real world” test by seeing how long these browsers took to load my blog, Smidgen PC. I performed the test three times and averaged the result. It seems that Firefox for Android is currently the best Android browser when it comes to speed. It killed the competition in the synthetic benchmarks, and earned a small but definitive victory in the page loading test as well. Skyfire seems slow overall, and the stock Android browser is second to last. Most other scores are comparable, however. That means many Android browsers are similarly quick, and you’re unlikely to detect major differences between them. What I can say for sure is that the stock Android browser is not the best one available. You may be wondering if you should switch – after all, the stock browser does seem “good enough”. Based on these results, I say you should. As I’m sure some readers will note, that’s not only because of speed. All of these browsers have additional features that are not part of the stock Android browser. It may seem like fussing over a few seconds of difference in loading times is silly, but the time shaved off can add up. A few seconds can mean the difference between an experience that feels butter smooth and one that feels bumpier than a hayride in a washing machine. So what do you think? Which Android browser gets your vote? Gingerbread stock beats em all on real world tests....ans Ive done hundreds. Miren browser! No doubt. Clean interface and more fast than Firefox 4. Tried Firefox 4 again... First page I tried to load n4g.com and it crashed. These benchmarks are deceptive. In real life usage I find Opera mobile smoothest, firefox slowest. Tried them all but Miren beats them all, haven't timed them but seems fastest, and certainly a very nice UI. Droid X. Sadly I find firefox rendering dreadful - sticking with xScope. Still, good to see there are even more options to try! Very True. I also hate that stupid grey checkerboard thing. You should had added Miren to the list. When using it it feels faster than all the other browsers on this list, and it's probably the one with the most clean and usable interface. Another thing that should be mentioned is that although Skyfire is really slow, it allows you to watch flash videos even if your android phone doesn't support flash, or doesn't have flash installed. It works with almost all video players, so that's a big plus. I've been using Dolphin HD for a couple of months, and it's not bad. It supports tabbed browsing but not nearly as much as Firefox in the way of plugins. I will given Miren a try.